The HSA provider my employer chose isn’t very good. The interest rate is very low if I leave the money in cash. The investment options are very expensive, with no index funds. I still use it because contributions through the employer are exempt from Social Security and Medicare taxes. I take the money out once a year and put it into the HSA account I prefer for better interest rate and better investment options. Here’s how I did it. Hopefully it will be helpful to others looking to do the same. 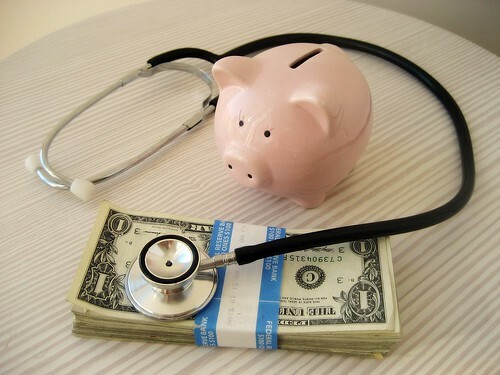 If you are looking for a better HSA, see Best HSA Provider for Investing HSA Money. 1. I logged on to the website of my employer’s HSA provider. I requested a transfer of the entire balance to my personal checking account. This does not close the account. If you don’t want this account any more, you can call and close the account after the rollover is done. 2. I mailed a personal check together with a rollover contribution form to my preferred HSA provider. Ask the receiving HSA provider for the rollover contribution form if you can’t find it on its website. That was it. If you have a checkbook for the current HSA, you can also write a check and send it to the new HSA together with the rollover contribution form. You can do this DIY-style rollover only once every rolling one-year period. The one-year clock starts on the date you take the money out of an HSA, not January 1. You have 60 days to deposit it to a new HSA. That’s enough for me. Trustee-to-trustee transfers aren’t limited in frequency but providers usually charge a fee to the tune of $20 to $30. It’s not worth it. Just do the rollover on your own. My payroll deductions and my employer’s contributions are still going to the provider chosen by my employer. I’m going to rollover the balance in the account again next year after I clear the one-year mark from this rollover. Thank you very much for sharing this information. Is there a reason you chose this route vs. using the “Transfer HSA to Alliant HSA” form? Trustee-to-trustee transfers are exempt from the once-per-year rollover rule. I just completed one moving some cash from my Alliant HSA to my new employer-provided HSA to get some fee-free investments started with this money. As the title says, if I used the transfer form the old provider ACS Mellon would charge me $25 for transferring out. Note to self – engage brain before turning fingers free. Won’t the previous custodian report that check simply as a distribution on the relevant tax form, when actually it was a rollover? I guess you can account for that correctly when doing your taxes? Michael – I suppose so. Because I did it in January 2013, I won’t see the tax form until 2014. You report the amount you rolled over on Form 8889, line 14b. Then it’s subtracted from the distribution. Very easy. Steve – I heard some HSA providers don’t issue a checkbook but they will send a check to you for self-reimbursement upon request. If you can’t find the checkbook which you may never had, ask the provider about self-reimbursement. You can deposit the self-reimbursement check to your personal account and then write a personal check to the new HSA provider for the rollover. The fee for a self-reimbursement check may be less than the fee for a trustee-to-trustee transfer. Very timely article as my employer just switched HSA providers to from Fidelity to Chase. I don’t like the investment options/fees with Chase so I think I’m going to do a trustee to trustee transfer of old funds from Fidelity to HSA Bank and then again at the end of 2013 from Chase to HSA Bank. I know Fidelity won’t charge me a fee for this so I should be good to go with this method for Fidelity -> HSA Bank. But for Chase -> HSA Bank, I don’t know if Chase will charge a fee or not. If they do, I’ll use your method and rollover $3,250 at the beginning of 2014. When I talked to HSA Bank though they did say that a rollover is considered a contribution to your account but it sounds like it’s easy to correct that on your taxes? It would be a “rollover contribution.” The provider reports it on Form 5498-SA, box 4, separately from regular contributions. You don’t include it on your tax return. One downside to this that I can see is that by using the Employer’s designated HSA account they take out the money PRE-Tax. I can designate a different bank to put money towards, but that will be POST tax. Does your employer let you designate any bank you want with PRE tax dollars for your HSA? Brett – No, I must use the employer’s chosen provider if I want to save on FICA taxes. I’m only rolling over old money. New money still goes to the provider picked by my employer. I’m thinking of how I’m going to rollover my funds from Chase at the end of this year to my HSA Bank account. I don’t want to buy checks from chase and they said they won’t write me a check so my options are to withdraw money for free from a chase ATM or there is also the other option to transfer to a personal bank account(Chase told me this would be free but not sure I believe them until I see it in writing). Once I get the money, i can write a check from my personal account to HSA bank as a rollover. Either of these two methods would be the same as yours right? Yes. Also see if you can withdraw cash at a Chase branch via a teller. Great post! I’m including it in my monthly newsletter. Following up on this… I, too, performed a rollover from my employer’s chosen HSA (Aetna/JP Morgan Chase) to Alliant Credit Union in January of 2013. I performed the rollover by doing an EFT withdrawal from the Chase HSA into my personal checking account (not at Alliant), then doing an EFT of that amount to my Alliant checking account, and finally notifying Alliant to do a transfer from my Alliant checking account into my Alliant HSA and coding it as a rollover contribution. No problems there. The initial distribution from my Chase HSA occurred on Jan. 24, but the rollover contribution was not credited to my Alliant HSA until Jan. 31. My understanding according to IRS rules is that I cannot make another rollover contribution until Feb. 1, 2014, but since that is a Saturday, the actual transaction won’t take place until Feb. 3, 2014. This means my 2015 rollover can’t occur until Feb. 4, 2015. This is kind of annoying, because it means if I continue to do rollovers every year, they would get later and later every year. I would much prefer them to be as close to Jan. 1 as possible. What’s not clear is how many rollovers are allowed in one year. The only definitive statement I’ve seen from the IRS says, “You can make only one rollover contribution to an HSA during a 1-year period.” But this is a little ambiguous: can I make one rollover contribution per HSA per year, or one rollover contribution per year, period, regardless of how many HSAs I have? For example, I’m thinking about opening an HSA this year with ELFCU, to make use of their investment options. From my reading of the IRS rules, I understand that I would not be able to rollover from Chase to ELFCU and also from Alliant to ELFCU in the same year (that would be two rollovers into a single HSA in the same year, which is clearly prohibited). But am I allowed to roll over funds from Chase to Alliant, and then from Alliant to ELFCU in the same year? In that case, each HSA would only receive a single rollover contribution. If anyone knows of a more detailed explanation of the rules from the IRS, I would welcome a link. The 1-year rule is tracked to the date when you received the distribution, not when you deposited it as a rollover. Still, if you keep doing this, the date will be pushed later and later, especially when you wait after you already passed the 1-year mark. The one-per-year rule is across the board, not per custodian or per account. The exact language of the law is IRC section 223(f)(5). See if you can *transfer* from Alliant to ELFCU for free. Alliant customer service said they don’t charge a fee for transferring out. So I called up ELFCU and they said they do not have a rollover form. I noticed they have a Contribution form http://www.elfcu.org/clientuploads/HSA_Contribution_Form.pdf with the multiple options for contribution type. Should I select “Rollover from HSA” or “Transfer from an HSA” when sending the form along with my personal check? Can someone comment on why for a Rollover it is necessary to write a check from one’s HSA checking account to a personal account; THEN write a personal check to the new HSA (i.e. ELFCU)? Why can’t you just write a check from the current HSA checking account to ELFCU to do a self rollover? If you have a checkbook from your current HSA, you can just write a check and send it to the new HSA. It’s not necessary to put the money in your personal account first. Not all HSA providers give a checkbook, but most allow you to link a personal checking account for electronic funds transfer. In that case you transfer to your personal account and then write a check from there. I found this thread a little too late. I initiated a transfer from HealthEquity HSA (my employer’s) to HSA Administrators (low cost Vanguard funds). This was pretty easy as I just faxed the form. Then it got weird. I don’t know if my employer’s HSA will charge me a fee as their website is incredibly opaque about it. What do know is that while the transfer is in process they have frozen ALL the money in my account. So I can’t use the debit card they gave me or get any claims paid. I can understand the 3-6 weeks delay but freezing my account is like the bank putting a hold on my entire balance each time I write a check. Bizarre. That being said I will use the above technique next year. I didn’t realize that I was avoiding SS and Medicare by having payroll deduction. That’s huge. In reply to myself. My employer’s HSA didn’t see the large Bold lettering that said DO NOT CLOSE ACCOUNT on the transfer form and attempted to close my account. The only thing that kept them from doing just that was that I hadn’t transferred the entire balance. Whew. All good now. Live and learn. I have an HSA through my previous employer. I was laid off by that firm at the end of January, 2014. Their HSA administrator is Chase and while I was employed Chase did not charge a monthly maintenance fee. I received a letter from Chase yesterday that since I am no longer employed, they are “transferring” my HSA account to a “new” Chase HSA account, which will now require a monthly maintenance fee. I have slowly been dumping Chase due to all their fees, having closed my Savings account and closed/moved my IRA. (Chase initially said they would have to charge me a $40.00 fee to transfer my IRA to my new bank, but after complaining that all their fees were the reason I was closing my accounts, they relented). I’m going to turn 65 in several months and do not plan to seek additional employment as I will go on Medicare at that time and will not be in a HDHP. Now I want to move my current HSA funds from Chase to another HSA account. I’ve done a fair amount of “investigating” and have identified a number of reasonable alternatives. My issue now is that I contacted one of the potential HSA banks yesterday to get information about transferring my existing HSA balance. The person I spoke with who was an HSA account representative, asked if I had an existing HDHP and I said no. His response was then I couldn’t transfer my current balance since I don’t now have an HDHP. After much discussion, I gave up. I subsequently went online and found an article on the Kiplinger web site that said I could in fact transfer my existing HSA balance to a new HSA bank even though I’m not currently in an HDHP. However, since I don’t currently have an HDHP I can’t make any “new” contributions to the HSA, which makes total sense since any “new” funds I would add would be after tax as opposed to pre-tax when enrolled in an HDHP. Even though HSA’s have been around for some time, it appears there is still a lack of understanding regarding the rules that apply to these accounts – even by the account administrators. If I can finally get definitive guidance, I will make a cash withdrawal from Chase and then either write a check to the new account or do an EFT. Andy – Although the law allows rollovers, the bank doesn’t have to support it. It’s possible this bank only takes new contributions. It’s also possible the person you spoke to is just misinformed. Find the HSA contribution form on the bank’s website or ask a rep to send a blank contribution form to you. See if the form has a “rollover” box. Thanks for the article! I’m very interested in reading about porting HSA’s, since the one my employer uses is sitting in a checking account earning .15% interest. Question – if I open up an account at say, HSA Administrators, am I allowed to use funds from the HSA to cover the $45 annual fee? By default they will take the fee from the money in your HSA. HSA Administrator isn’t the best provider though. I just added a link to my other article in the second paragraph. First, great article! Secondly, how did you determine the yearly fee for HSABank? I just signed up with them and the only fees that would appear to be relevant for me would be the $2.50 Montly Account Maintenance fee for keeping a balance lower than $5k, as I would be investing my HSA deposit into a Vanguard ETF via TD Ameritrade. Look at the third item in the second table: Monthly Investment. do we have to strictly follow rollover “only once every rolling one-year period” rule? I made rollover from my HSA (Chase) to ELF in 2014, exact date to ACH money to my bank acct (so I could write check mail to ELFCU) at HSA was 2/19/2014. So this year doing it again, I have to wait till 2/19/2015 to ACH it? reason I asked was because I got a letter from Chase on 1/11/2015 that it claimed will transfer my HSA to “a new HSA” at Chase (because I do not have HSA plan for this year) within 30 days. so I hope to do ACH all out before 2/10/2015. You have to strictly follow the rollover “only once every rolling one-year period” rule. See the quote and the link to the law in the reply to comment #15. Transfers don’t count. You can request a transfer sooner but you may have to pay a fee to Chase for the transfer. Any idea how to properly transfer an entire HSA account to an ex spouse by court order? My HSA provider seems stumped. I have shown them the Federal Code stating that I can transfer with no tax penalty, but how do you “transfer”? They want me to cash it out, but that seems risky with the IRS. Thopughts? I have an HSA with BenefitWallet w/former employer, balance is $4k but less than $5k. I’m in CA. 1) What HSA provider should I use to avoid the $5k min account requirement, monthly fees, inactivity fees? 2) Would like to investment ETFs, bonds and/or indexes are fine. But I want to reduce and/or keep all associated fees. What HSA do you recommend for that offers good investments with little to no fees? 3) Anything else I should consider? ippo – Please read the article linked in the second paragraph. I want to rollover my old HSA at HealthEquity into Optum Bank (they charge $25 for a trustee-to-trustee transfer). So I tried taking a distribution from HealthEquity, but it only allows me to take out the (Total Amount – $25), citing that a $25 account closure fee is held in reserve and may not be used for reimbursement. Is there any way around this? I may have to pony up and pay the fee since HealthEquity charges a $3.95 maintenance fee each month. Not really. If you are done with HealthEquity, you might as well close it. Ask whether they charge $25 for the transfer plus another $25 to close the account or the one $25 will both transfer out and close it. Thanks for this post, Harry. One question is that if I don’t want to keep the old HSA account, can I just request the transfer to my checking account and close that old HSA account in step 1 at the same time? Or I have to wait until my check is deposited into the new HSA account? Yes you can do that. You don’t have to wait. My old HSA bank charged $25 to either electronically transfer to my new HSA bank or to cut a check for a rollover. It turned out to be easier to do the electronic transfer. As I only had to do it once, it was no big deal, but if you are doing this annually, that $25 will add up. I did ACH transfer for the distribution. I wrote a check for the deposit because I had to mail a signed form. Does anyone know if it is it possible to create your own check for your HSA account if you can determine the account and routing number, if the HSA provider did not provide a checkbook? I’m thinking of how you can order personal checks from 3rd party websites…wondering if maybe it would be an option to do something like that or use a template in Word or Excel or something to make a one time use check? Chris W – It’s not necessary to create your own check for your HSA account. Most HSA providers can send you a check or let you link a checking account for electronic funds transfer. Hi Harry, thanks so much for the information in the article. My wife currently has two “old” HSA accounts from previous employers, and a third HSA account with her current employer that the employer makes regular contributions into. We want to open up a “new” account with a different provider that will have lower fees. We also want to close the two “old” accounts, transfer those balances into the “new” account, and transfer the balance in the current account into the “new” account we will be opening. We obviously want to keep the current account open since the emplyer will continue to make contributions into this account. To summarize, we ultimately want two accounts- the current employer account and the new account (which we have yet to open). I was looking through the comments section and am a little confused about the process and what I am allowed to do. From reading above, it looks like I am allowed only one rollover a year. As per my plan as stated above, though, there will be three transactions into the new account. Is this allowed? Is there a difference bewtween a “rollover” and a “transfer”? If I am allowed only one rollover but an unlimited number of transfers, is this a way around this dilemma? Thanks for any help you can provide. There is a big difference. Transfers are not limited in frequency. Only the HSA custodian can do it for you. They may charge you a fee for doing it. Rollovers are limited in frequency. You can do it yourself. There is usually no fee. So find out which custodian doesn’t charge a fee or charge a lower fee and have them do the transfer. Save your limited rollover for the one that charges the most on transfers. I have Elements Financial and my employer recently started offering HSA option with HSA Bank. I have an investment account for Elements Financial through TD. What is the best way to transfer/rollover from Elements with my investments to HSA Bank. Ask Elements if they charge a fee for transferring out. Whether you do a transfer or rollover I think you will have to sell your investment and get the money to the bank side first. Have you seen the online portal for Premera through ConnectYourCare/UMB Bank? I can’t find any way to request a check that doesn’t charge a fee. There are fees for the “Account Withdrawal Request”, the “Account Closure Request”, and I can’t find any other way to get money out of the account. I have a debit card, but no PIN as far as I know. I do have electronic transfers set up for when I request reimbursement of claims, but that’s the only free way I can find to get money out of the account. Any suggestions or am I just stuck with the $15 fee to move the funds elsewhere once a year? Just do an electronic transfer with yourself as the payee. The only way to do an electronic transfer is to tell it I want to reimburse myself for a claim. Are you saying I should make up a fake claim with a fake date of service and provider in order to transfer the money to myself? You can put “Indirect Rollover” as the name of the provider. They won’t care. This is ridiculous. I called the provider and they say the only way to get money out is to create a claim with IRS approved information and request reimbursement for it or to pay the $15 fee to transfer to another HSA. There is no checkbook. There is no way to initiate a transfer without a claim or a $15 fee inducing transfer request. There is no PIN on the debit card to get cash out. I give up. I’ll leave the funds in this account until I leave my employer and then I’ll transfer the balance out to my credit union HSA paying 1% and close the account. There is also no routing number to set up a transfer from the outside. Thanks – the “indirect rollover” as the provider name looks like it should work. Sweet! I’ll do that next time since I already did my transfer of excess funds from 2015’s contributions. Does anyone know if HSA can initiate an electronic trustee-to-trustee transfer into the account? My workplace HSA is not very good, and will NOT charge a transfer fee if the transfer is initiated electronically by the new custodian bank/account. This would be great since I’d like to make more than one transfer per year. I checked the HSA bank website and the only process/form I see includes your previous trustee sending a paper check. Tried calling HSA bank but waited on hold more than 30 minutes today. . .any help appreciated! Simply make an electronic payment (bill pay) from employer’s HSA to your personal HSA. I do this bi-monthly, no fees or tax implications. During tax time just check the box indicating you transfered from one HSA to another. Watch out you don’t go over the limit if you earned a few cents in the employer’s HSA and paid it all to your HSA. Boom! This was what the large bank providing my employer’s HSA advised. Our tax system is based on voluntary compliance. You can check whatever box on your tax return and not get caught but it doesn’t make it legal. Why is the method of ETF transfers between HSA accounts that ResearchAll describes not completely compliant with the law and IRS rulings? Even though you are the one initiating the transfer, I am not sure this would not be classified as a ‘trustee-to-trustee’ transfer anyhow since you do not have intermediate (ie, non-HSA) access to the money, thus not limited to the once-per-year limits. Because the trustee has to recognize it as such. When you initiate the EFT, the trustee doesn’t know the other end is an HSA. They are not going to record it as a trustee-to-trustee transfer. They only know it’s a distribution out of the HSA. When you have a distribution, you can only say it’s (a) reimbursing eligible expenses; (b) a rollover, subject to time and frequency limit; or (c) a taxable distribution. What does coding have anything to do with it? At the end of the year, I get one 1099-R, so it can’t tell between 1 and 12 operations. That’s what the IRS gets, too. Can you please point me to the relevant IRS tax code and/or private ruling letter where it specifies/clarified the definition of “indirect rollover” vs. “trustee-to-trustee transfer”? This is where I am getting conflicting information from different sources and would appreciate clarification on my end. Look at 1099-SA instructions to the trustee. When you receive a 1099-SA, it’s already not a transfer. This would seem to indicate that not all 1099-SA reportings are rollovers, as I will (and have) received a 1099-SA for this in the past. How is this any different, indeed in fact entirely consistent with, the advise ResearchAir (rather, the bank ResearchAir has) has given, above? It would seem to indicate a check cut to “newHSA FBO ResarchAir” is not, in fact, a rollover. And it would also seem to indicate that a direct transfer, by whatever means, between “oldHSA” and “newHSA” without ResearchAir touching it would be kosher. Edit — yes, I know the link is for IRA rollovers and such, but there exists little or nothing in the IRS that calls out for HSA, and it seems reasonable to assume the rules regarding IRA definitions of transfers vs. rollovers are the same for other tax-advantaged accounts. When you receive a 1099-R from an IRA provider, it’s already not a transfer. You may have received 1099-Rs when you moved money between a 401k and an IRA. Those are not IRA-to-IRA transfers. When I did IRA trustee-to-trustee transfer, I didn’t receive a 1099-R. When I did HSA trustee-to-trustee transfer, I didn’t receive a 1099-SA. The bank will do the billpay or ACH however often you want. They will record it as a distribution and issue the 1099-SA. Whether you have to pay tax on the distribution because you violated the rollover frequency requirement is not the bank’s problem. If you don’t include it, the IRS will come ask you about the distribution because it received the 1099-SA from your HSA trustee. If you include it on 14a, do you say it qualified as a rollover on 14b without regard to the frequency requirement? If by “it can’t tell between 1 and 12 operations” in your previous comment you meant the IRS will not know whether you did 1 rollover or 12 rollovers in a year, it goes back to the issue of voluntary compliance. If you are willing to lie and say it was just 1 rollover, you may not get caught, but that doesn’t make it legal. Why is it so difficult to just stick with one rollover per rolling year? There isn’t much to gain to invest a few thousand dollars a little sooner. Think long term and don’t try to wring out every last drop. You still have not indicated that receiving a 1099-R or 1099-SA makes it a rollover, especially since the IRS specifically says that it is not. Just becuase the instructions tell the bank not to create a 1099-SA/R does not make the creation of a check (electronic or paper) into a taxable event or a rollover. Please point me to the IRS case law which disagrees with this statement. I show you IRS documentation that says otherwise. I get 1099-R for rollover from tIRA to 401(k), even though it is not a distribution. I get 1099-SA for liquidation of HSA FBO fidelity, and it was not distribution. All I had to do is correctly affirm that this was a non-taxable trustee-trustee transfer at filing time and all is OK. It is my position, and that of many others, that the receipt of a check, no matter how it is coded by the outgoing institution is NOT a rollover AS LONG AS you do not have access to the money. The same is true for incoming money. Whether or not it is one time or twelve. In fact, if the outgoing institution issues a paper check, they are *required* to issue a 1099-SA, because they have no guarantee that the money will ever be redeposited into the account, or that the receiving account is, in fact, another account of the same type. It will get counter-balanced by a contribution form (4998?, I forget) that the taxpayer must affirm is the deposited amount. And yet, this case is definitively and specifically NOT a rollover according to the above link, and not subject to the 1-in-12 rule. The real problem as I’m sure you will agree, is that the IRS is being quite ambiguous about this, with allowing a custodial transfer while allowing you to receive a paper check. Case law in 2014 (2015?) that cracked down on this kind of behavior was clearly trying to stop 60-day loans from tax-advantaged accounts instead of preventing folks from moving money from one account to another of the same account. As for why does it matter? I like to keep things in as few institutions as possible. Easier to track, harder to forget. Higher fees. I just want to automate a monthly withdrawal. I’m not the one you have to convince. You sign your tax return. It’s between you and the IRS. Are you going to report the amount on Form 8889 line 14a or not? If you believe it’s a transfer the instructions tell you not to. Including the amount on both lines 14a and 14b would be false. Many false returns are accepted by the IRS. They are still false though. Lets put the facts out. I have provided exact IRS verbage refuting that statement that you have not responded to multiple times. You are correct, I do not need to convince you; I need to raise the point to your readers to avoid your readers from getting a false impression that the OP procedure — suggested by a HSA custodian — was not allowed by the IRS. Nothing you have said contraindicates the legality. 1. When a HSA custodian makes out a check to “HSA custodian 2, FBO ryman554”, is that a rollover or trustee-trustee transfer? A 1099-SA *will* be generated. 2. How many of these are allowed in a 12 month period? 3. Would it be different if the HSA custodian instead was instructed to deposit the money directly via ACH transfer? 1. trustee transfer. See referenced IRS text, above. 2. any number. See referenced IRS text, above. But you are absolutely correct, I do not know how to file this form properly. Form 8889 would be the correct place, but even there, for line 14b, it says not to include trustee-trustee transfers. So I am now in a quandry — I firmly believe that this is a trustee-trustee direct transfer and not a rollover based on what the IRS states. I agree with you that there is no way to correctly report this to the IRS. 1) It depends on how the check was generated. If you followed the transfer procedure at the HSA trustee and then the trustee made the check, it’s a transfer and the trustee will not generate a 1099-SA if it follows the IRS instructions correctly. A check and a 1099-SA are not directly linked. A transfer can still use a check and it will not generate a 1099-SA. You only found the IRS saying a transfer can use a check. Nothing said a 1099-SA has to be issued when a check is used for a transfer. The IRS said if it’s a transfer, do not report on 1099-SA. The logic equivalent of “A => B” is “not B => not A.” Therefore “not (no 1099-SA) => not a transfer”. If you don’t follow the transfer procedure provided by the trustee and instead you use the distribution procedure, the trustee will treat it as such and it will issue a 1099-SA. When you ask for a distribution from the trustee, no wonder the trustee gives you one. 2) As many times as you wish and the trustee allows. The trustee doesn’t care what you do with the distributions or whether the distributions are taxable to you. The IRS limits you to one tax-free rollover contribution in a rolling year. 3) No difference whether the trustee uses ACH or check. What matters is what procedure you use to instruct the trustee and what the trustee does by your instruction. When you ask for a transfer you get a transfer. When you ask for a distribution you get a distribution. If the trustee wants to automate its transfer procedure, it’s free to do so. It can very well have you fill out a form just once and do monthly transfers. You just have to persuade your trustee to set it up that way. Just by using its automated distribution procedure doesn’t turn the distributions into transfers, because you start with asking for a distribution. When you want a transfer, you have to ask for a transfer. If you firmly believe the monthly billpay or ACH are trustee-trustee direct transfers, you would not report them on Form 8889, as the IRS clearly instructed. If the IRS asks about your unreported HSA distributions, you then present your argument. If you make them agree, it’s all good. If they don’t agree, you get a mess. 11 of the 12 distributions are taxable, not eligible for rollover, and subject to penalty. The money put into the receiving HSA becomes excess contributions, which must be taken out, and subject to excise tax if not done in time. It’s not a risk I want to take. Nor do I want other readers to take it. I’m in the situation of attempting to rollover HSA funds from one provider my company used in 2016 to a new company in 2017. I do have a checkbook for the former account and have read that you can transfer the funds directly to the new provider/account via check. … This may be a silly question, but to whom do I make the check out to? To the new account provider with a notation that it’s designated for my new account? Or do I essentially write a check to myself? Ask the new company. You also need a form or letter to make it clear it’s a rollover, not a regular contribution. Last year I used a check from the checkbook of my current HSA and sent the amount directly from my custodian linked to payroll to my preferred HSA custodian. I just called my preferred custodian to refresh myself on the steps before I do it again this year and they seemed to advise against the way I did it last year. They also seemed to not have my 5498 coded as a rollover contribution, even though I selected that box on the paperwork. And the other custodian sent me a 1099-SA, making it look like I took a distribution. Are you not supposed to receive a 1099-SA from the rollover contribution? Will I be penalized for this? This year, I am transferring from current custodian to personal checking then from personal checking to preferred custodian, along with statement showing withdraw and indicating to treat as rollover contribution. You are supposed to receive the 1099-SA. Your distributing HSA custodian doesn’t know what you did with the check. The receiving custodian did it wrong when it ignored the rollover box you selected. You can attach a letter and see if that makes it clearer to them. My employer’s HSA provider is also HealthEquity. This is my first year contributing to HSA and I just reached $2000 balance, which is a requirement for investing with them. They have a good selection of Vanguard funds, but they charge 0.033 % monthly fee in addition to the expense ratio of the fund. That translates to 0.396% annual fee on the total balance. Not great, but not terrible either. They offer Vanguard’s Total International Stock Index fund VTPSX which has expense ratio of 0.07% . With the annual fee the total comes to 0.47%. I wonder with the amount being so low, it is worth moving this somewhere else? As the author of this blog, I also don’t ming leaving some money on the table. Does my logic seem reasonable, or I missed some other disadvantages of using HealthEquity for HSA? I also have HealthEquity through my employer. The combination of low fees, Vanguard funds and having payroll take care of the proper deductions they’re hard to beat. Before they offered low cost funds I used to transfer to HSABank HSA every pay or so, that was a PITA. Now I get an email every pay from HeathEquity that tells me my funds have been deposited and I just log on and purchase shares, it’s quick and easy. Very happy with them. When your balance is still relatively low it’s probably not worth opening another account elsewhere yet. However, HealthEquity lets you invest only the amount above $2,000 (at least that’s the case under the contract with my employer). If you move the money elsewhere, less $25 minimum to keep the HealthEquity account active for future payroll contributions, you get to invest the full amount at some places. It just depends on whether you want to invest the $2,000. Thanks! That’s an important detail that I missed somehow. HealthEquity isn’t transparent about their rules and fees. I do see now that I cannot invest the initial $2000. I’ll roll over what I can to HSA Bank or Saturna. Just note HSA Bank charges an extra fee if you don’t keep $5,000 in cash. Can anyone confirm if, legally, we can request a reimbursement check from one account, deposit the check within 60 days, and file this as 60-day rollover? In other words, from 1099-SA’s point, there is a no difference between a reimbursement check, and, a transfer to personal checking account? There’s no difference. It’s tax free only if you re-deposit within 60 days and you haven’t used this maneuver within the past rolling one year period. Hopefully this isn’t a dumb question, but when you mail a personal check together with the rollover contribution form, is the check made out to yourself? I’m guessing so since it’s going into your own HSA account. We’re about to do a rollover from BB&T to HSA Authority. I called to find out which form to use but they didn’t seem to know for sure. I’m using the “Contribution and Investment Selection” form because it has the Rollover box to check, so it looks right. I’ll just leave the Investment portion blank. Hello TFB, great article and website, thank you. Has anyone attempted to do a rollover from BenefitWallet to HSA Bank? My employer switched from BenefitWallet to HSA Bank, and I’m trying to move my funds. My employer hasn’t provided us with any instructions or tips on how to do this. I’m getting conflicting information from the people I speak to at HSA Bank. I’m trying to avoid doing a trustee-to-trustee transfer because of the fees that BenefitWallet charges (one person told me $25, another person told me $35), but regarding a rollover, in talking with two people at HSA Bank, one person said that I cannot simply write a check from my old HSA account paid to HSA Bank with the rollover application/form; instead, the check has to be from the actual custodian (?). But I called HSA Bank again later and a different person told me the opposite: she said I could write a check from my old HSA savings account paid to “HSA Bank” for the rollover, although usually people have their old HSA write a check payable to the account holder, and then you send that check in the rollover application to HSA Bank. My old HSA says they cannot send me a check directly because my HSA account is too large (more than $30,000) because of the Patriot Act, and that I could only do a trustee-to-trustee transfer (which would be a $35 fee), OR I can write a check from my old HSA savings account paid to the new HSA, and then call my old HSA back to say I’m closing my account after the funds get debited. So, hearing conflicting advice from HSA Bank, I wonder if anyone out there has actually done this? Do I need to do anything on my tax form if I do the rollover with a check? I get that I can do this only once per 12 months. As the receiving end of the rollover, HSA Bank wouldn’t care who’s writing the check or which account it’s drawn from. They have a check, and a contribution form from you saying the money is a rollover. They just deposit the money and record it as a rollover contribution. As the sending end, BenefitWallet will record the withdrawal as a distribution. They don’t know why you are taking the money out. You say on your tax form the distribution was rolled over within 60 days and it was the only rollover in a rolling 12-month period therefore you shouldn’t be taxed. My husband had initially set up an hsa with Alliant credit union, where money has been deposited by his employer to the 6750 max last year. Come to find out that the credit union never opened an hsa for him and has simply been putting the deposits into a regular savings account!! He set up the account over the phone and the lady gave him the account number to directly deposit to (and he isn’t great abut following up since he was only depositing and never withdrawing). Any ideas on how to get this fixed? Right now Alliant is acting clueless but we need that tax free money for a baby due this year–how can we handle this without big trouble from the IRS? I like this rollover idea, but we wouldn’t get the right tax forms since it’s not a transfer from an hsa account… From what I’ve been reading Alliant stopped offering hsa accounts so we’ll have to find a new bank anyways! Regarding Alliant no longer offering HSA accounts, I had an HSA with Alliant and they transferred our account to HealthEquity. You could look into setting up an HSA with them and I *think* you’d be able to use the post-tax dollars to contribute $6750 to the account for 2017 before the April deadline. Then when you file your taxes, use Form 8889 to figure your deduction. Make sure your husband files the necessary paperwork with his employer to setup payroll deductions for 2018. I chatted online with Lively HSA customer service today. They insist that your current HSA provider has to “code” a check correctly and provide it directly to them (this is what they call a “rollover”) to avoid it being considered a distribution, that you cannot simply write a check from your own HSA account to another HSA account. I find this unnerving — HSA’s are their only product, yet they are unfamiliar with IRS form 8889 and they don’t know the difference between a T-to-T transfer and a rollover? Their account process requires you to provide the name of your current custodian and your account number, even when you select “rollover” vs. “trustee-to-trustee,” and asks you if you want them to close your existing account on your behalf. It seems I cannot open an account without them initiating a transfer from my current custodian, so I guess I’ll keep shopping. Disappointing. Trying to do the roll over from HealthEquity on my own and their Customer Service is not being helpful. From what I understand, the author of this blog was able to do that transfer online. If I try to do the same on HealthEquity website, the system asks me what type of service/claim it is, and won’t let me continue until I provide that information. I also called them and they said that they can mail me a check right away. But their website says to use Account Closure form. The CS agent didn’t confirm whether it’s essentially the same thing and can be considered roll over an HSA on your own. Has anyone done the roll over on their own from HealthEquity? Could you share the details please? You create a claim for Rollover Distribution as the provider’s name, Medical as the service type, and any date range as the service dates. It’s treated as a distribution the same way as a reimbursement. You report to the IRS on your tax return how much of the total distribution in the year was reimbursing eligible expenses and how much was rolled over to another HSA. Be sure to do only one rollover per rolling 12 months: request the next rollover distribution at least 12 months after this rollover is deposited into your new HSA. How should one report his/her HSA rollover (not a transfer) on tax return? Thanks! More specifically, I can’t find a place in form 8889 to report the rollover amount. Form 8889, line 14b: Distributions included on line 14a that you rolled over to another HSA. Why not just leave your employers HSA at $1 or something, and make your contributions post-tax to the desired HSA, then deduct it from your tax return? You still get the full tax benefits. Contributions made through payroll are exempt for social security and Medicare taxes. I have a PayFlex HSA account thru Aetna with about $37000.00. I will keep the PayFlex account. Can I roll over a portion to IRA Services in San Carlos, CA for a self directed HSA account? I have several IRA accounts (Traditional/Roth) with them and invest in a real estate private mortgage lending LLC, paying 8%. Can I put this money to work like the IRS’s mentioned above? Both HealthEquity and Saturna customer service representatives have told me that there is no fee for a trustee-to-trustee transfer but I have not been able to find anything online that confirms this. HealthEquity advises I use the Account Closure form to complete a transfer to another HSA custodian and select the option to do a partial transfer/will not close account. They really need to update this form because everything on it talks about closing the account, even though there is an option to leave it open. But that’s neither here nor there. One representative told me that I can request to have the $25 “account closure fee” waived and transfer the full balance and leave the account open with a $0 balance. Apparently, I don’t have any monthly account maintenance fees and there is no minimum balance requirement to keep the account active (not sure if this is the same for everyone’s HealthEquity account). It sounded like a lot of follow-up with no real guarantee, though. So, I will probably just transfer the (full amount – $25). If this works out, this will be the way to go in the future because the trustee-to-trustee transfer doesn’t generate a 1099-SA and I will be able to do next year’s much earlier in the year! I read elsewhere although it’s true in theory you can do a transfer and leave the account open, in actual operation HealthEquity sometimes closes the account in error and charges you the $25 account closure fee. You can call back and have the account re-opened and get the fee credited. So it depends on your luck in avoiding their error and your tolerance for correcting the error versus getting a 1099-SA for a rollover. BG: If I selected partial transfer and left $25 in the account, it would be closed. But if I selected partial transfer and left $25.01 in the account, it would not be closed. True or false? Lisa R.: Correct. If you leave 25.00 only, that is our account closure fee so then your account would be zero and closed. If you check the partial closure and leave 25.01 in there then we will leave it open. We will see how this goes. Going to wait until the end of the month for my interest payment to be credited to my account and then submit this account closure form. Then I mailed/faxed the forms with the check to Saturna. This way, i didn’t have to use any account closure form. Hope this helps. If I do a rollover by withdrawing from HSA1 in December 2018, and depositing in January 2019 at HSA2 (and making sure HSA2 knows it is a rollover), how is this reported? When it comes to doing my 2018 tax return, how exactly will HSA2 report to the IRS the rollover they received in January 2019, so that it is matched with the withdrawal from HSA1 in December 2018. I understand I would report the rollover amount on Line 14b of F8889 for my 2018 tax return. And I believe HSA2 would report the rollover contribution on F5498SA box 4. But for which tax year would the F5498SA report the rollover contribution. Could it be that it is reported for 2019 instead of 2018? Would this mean that the IRS might disbelieve the rollover amount I report if it didn’t appear on the 2018 F5498SA? You might think I should avoid such a scenario, but I do actually want to float the 5 figure balance as a loan to myself from mid-December to mid-January. HSA1 will report the total distribution during the year, including money you withdrew for qualified medical expenses on a 2018 Form 1099-SA in January 2019. You will report the total distribution and the amount you rolled over on you 2018 Form 8889. HSA2 will report the rollover contribution received on a 2019 Form 5498-SA in May 2020. Does that mean that the IRS would likely question my 2018 tax return, and send a tax bill based on the assumption that the the withdrawal from HSA1 was kept by me instead of being rolled over to HSA2? Presumably I could send them documentation of what actually happened, to fix it, but this seems a pretty uncomfortable situation to be in. I don’t know what the IRS would do. Maybe they will take your words for it. Maybe they will ask for evidence. Can you DIY a rollover via ETF from existing HSA to newly established HSA instead of writing and depositing check? Apologize if this was addressed previously. Thank you for all the insights and discussion. I assume you mean EFT, electronic funds transfer, not ETF, exchange traded fund. The distribution from the existing HSA to your personal account can be via EFT. The rollover contribution from your personal account into the new HSA can be done by EFT only if the receiving HSA has a way for you to specify it’s a rollover, not a normal contribution. If not, it’s better done by a check with accompanying deposit form or letter noting it’s a rollover, not a normal contribution. 1. Take a full distribution from HSA1 to my checking account. 2. Take a full distribution from HSA2 to my checking account. 3. Write a check to myself from my checking account and deposit the above combined distributions as a rollover contribution to HSA3. Would this count as one rollover in the eyes of the IRS? I see. Guess I’ll have to absorb the direct transfer fee on one of them. Is it possible to do 1 HSA, 1 IRA, and 1 Roth self-directed rollover within the same 12 month period, or is it 1 per 12 months regardless of type? You can do one HSA rollover per rolling 12 months plus one IRA (regardless Traditional or Roth) rollover per rolling 12 months. I found it easier to absorb the $25 closing fee from HealthEquity and just do the transfer directly from custodian to custodian online. HealthEquity provided all the online forms to initiate the transfer, and it took about a week for it to process. Not a big deal, and I don’t have to think about doing a roundabout transfer (custodian-checking account-custodian) to save $25 (which I will make back in a little over a year anyway by avoiding HealthEquity’s monthly account fees, plus lower investment costs at the new custodian).